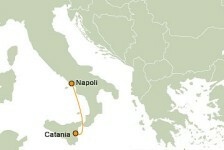 TTT Lines ticket reservations, ferry timetables and passenger information for TTT Lines sailing to and from the ferry ports of Naples in Sicily to Catania Italy. Booking TTT Lines tickets has never been easier, we compare all TTT Lines prices in real time providing fast quotes so you can buy the cheapest available TTT Lines tickets to and from the ferry ports of Naples in Sicily to Catania Italy online with instant confirmation. So whether you are looking for a day's shopping trip abroad or a holiday break in the ferry ports of Naples in Sicily to Catania Italy travelling by TTT Lines is a quick, easy and stress free way to get there and back again. Book you TTT Lines tickets with us and enjoy more choice and flexibility. With the latest TTT Lines crossing information and timetables for all sailings to and from the ferry ports of Naples in Sicily to Catania Italy including information on the ferry ports and useful tourist information about the destinations our detailed route and city maps will help you plot your TTT Lines ferry journey. If are travelling to the ferry ports of Naples in Sicily to Catania Italy then book a ferry crossing with TTT Lines and arrive at your destination refreshed, relaxed and happy. TTT Lines offers fantastic fares to and from the ferry ports of Naples in Sicily to Catania Italy ferry ports. Book TTT Lines Ferry tickets to and from the ferry ports of Naples in Sicily to Catania Italy online in advance at Ferryto.co.uk and you will always enjoy our cheapest available ferry ticket price. The price you see is the price you pay. There are no hidden extras or surprises such as added fuel surcharges or booking fees and we do not charge you anything extra for paying with a Visa Electron card. The price we quote you for your selected TTT Lines route, onboard accommodation and vehicle type is all you will pay, and that's a promise. To obtain a TTT Lines Ferry ticket price and book your ferry ticket securely online please use the real time ferry booking form on the left. TTT Lines operates one daily car-carrying Sicily ferry from Naples to Catania. The journey takes 12 hours and the ferry departs from Naples at 21:00 P.M. from Mondays to Saturdays and at 19:30 P.M. on Sundays. camping on board is available from 01 April to 31 October, Saturday and Sunday for departures from Napoli and Friday, Saturday and Sunday for departures from Catania. For camping on board must be indicated on the ticket, boarding CAMPING ON BOARD. Embarkation time is three hours before the ship’s scheduled departure time) and has stipulated agreements with: la Confederazione Italiana Campegiatori - il Club del PleinAir - Caravan and Camper friends - Turit - Gruppo Amici Camperisti Catania - A.C.T.I. Palermo - A.C.T. Italia Federzione - Associazione Nazionale Coordinamento Camperisti - AC Autocaravan – Touring Club Italiano – Camping Card International - Camperlife e Camper Club Italiano - so we can give their members discounts foreseen by the "Special Camper" promotion. camping on board is not available on booking online! note: for booking, please furnish: license plate number and vehicle length – name and surname of passengers – date and departure/destination route – membership card number - telephone/fax number or e-mail address. M/n Trinacria and M/n Partenope. They are both newly constructed Roro/people ships that came into operation in May 2002, under Italian flags, sailing at a cruising velocity of 22 knots. The ships measure 186.50 meters in length; maximum width 26.60 meters wide and carry a gross weight capacity of 7.200 tons. Their gross tonnage capacity totals 25.000 tons. The ships carry a maximum of 950 passengers. Accommodation on each ship is as follows: all 198 aircraft-type chairs are reclining seats there are a total of 78 cabins divided into internal and external cabins; each with its own bathroom and shower; two cabins are available to accommodate disabled passengers. Each cabin is comprised of two bottom bunk beds and two top folding bunk beds, a desk top, a chair, a closet and a mirror. For meals, the ships each have an elegant dining room where passengers can find a self-service restaurant and an à la carte restaurant. One can also relax in the restaurant bar, the bar located at the stern of the ship, and/or in the living room with armchairs, comfortable sofas and coffee tables. There is also a designated area with slot machines, video games and a shop. The ships are equipped both with escalators and nice elevators. Each ship has a load capacity of 2.040 meters in length for commercial vehicles in addition to the capacity of embarking 75 cars under 1.80 meters high on the car deck. * M/n Trinacria is identical to M/n Partenope, it only differs in the that it has two suites. Best Price Guarantee - We always offer you our lowest available TTT Lines ticket price and there are no hidden extras or surprises such as added fuel surcharges or booking fees and we also we do not charge you anything extra for paying with a Visa Electron card. The price we quote for your selected TTT Lines to or from the ferry ports of Naples in Sicily to Catania Italy, onboard accommodation and vehicle type is all you will pay, and that's a promise! In the unlikely event you find the same all inclusive TTT Lines ticket cheaper in the brochure of any other tour operator we promise that we will do our best to beat that price or offer you the choice of requesting a refund. To book TTT Lines tickets please click here. Discounted Group Travel with TTT Lines - Ferryto.co.uk offer a dedicated personal and affordable TTT Lines group and coach party ferry passenger reservation service offering you the lowest available rates to and from the ferry ports of Naples in Sicily to Catania Italy. Our specialist TTT Lines group travel team will secure the best deal for you and your passengers. The only requirement to qualify for discounted group travel rates is that your party should be at least ten people and at the same time. For more information about group travel on TTT Lines please click here. Ferry Logistics offer a personal and affordable TTT Lines freight and cargo reservation service to and from the ferry ports of Naples in Sicily to Catania Italy. In addition to offering preferential rates to commercial operators and haulers Ferry Logistics is now also able to offer discounted rates to private customers such as those wanting to take transit vans on any of the TTT Lines routes serviced. For more information and an instant online quote for your commercial vehicle ferry crossing please click here. At ferryto.co.uk you are able to obtain live TTT Lines ticket prices, check availability and book TTT Lines car and passenger ferry tickets to and from the ferry ports of Naples in Sicily to Catania Italy at our lowest available ticket price. Ferryto.co.uk is part of the world's largest online ferry ticket distribution network providing the ability to book over 80 major European ferry operators including with TTT Lines to over 1,200 ferry routes throughout the UK, France, Spain, Ireland, Holland, Eastern Europe, the Mediterranean, the Baltic and North Africa. Choose Ferryto.co.uk for the cheapest ferry ticket prices if you are taking a short cross channel car ferry to Calais France, a ferry to Ireland or a crossing to Amsterdam Holland. We also have ferry offers to more distant ferry travel and mini cruise destinations like Spain, Denmark and the Greek islands.